Any bead with a hole large enough for a rubber band to pass through immediately becomes a great addition for a bracelet. They can be placed anywhere on the loom and are permanently attached after the bands are hooked. I take no credit for this idea, Charlie came up with it all by himself! The finished bracelets have beads sitting around the outside edge. You can also place the brands straight onto the loom as if they were just rubber bands and hook them up as you normally would. I would use beads that are a bit smaller than these though. I bought these from Rainbow Fun and even though they are great looking beads, we haven’t been able to make a bracelet that didn’t either have the beads spaced too far apart, or bunched up too close together. 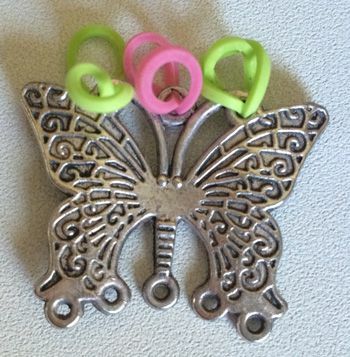 These little experiments made me wonder how would I go about adding large bracelet charms like my butterfly shown below. I knew it was possible because of the Loomey Time watches so I checked out their website, where you can find a good selection of videos on adding bands to Loomey Time watches, with bands in lots of different styles. So, using all this information, here’s what I came up with. 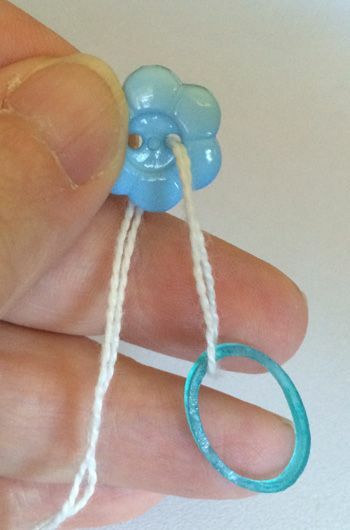 Step 1: Thread bands through the holes in your charm. Step 2: Put your bands on your loom, leaving the end of the design open. Step 3: Put the bands you threaded through the charm onto the end of the loom. Now, beginning at the end where you have placed the charm, hook your design. I made a triple single bracelet but there are many different designs that will work with this method. Here is the first half of my bracelet. 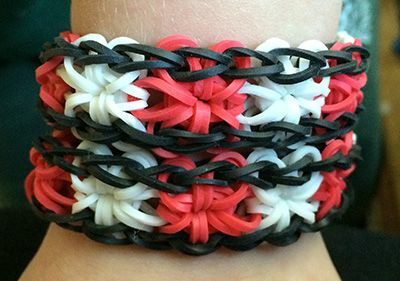 I used the full length of the loom to make an adult sized bracelet but you can start placing your bands halfway up the loom for a kid size one. Repeat for the other side. Then make some more! The second bracelet below is a starburst bracelet, like the one I’ve shown before. 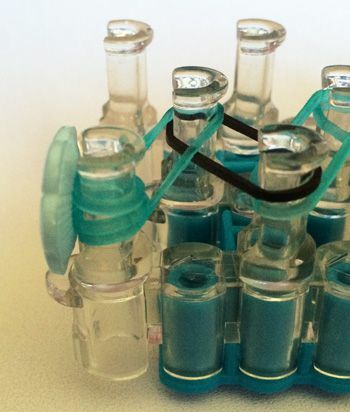 This technique can also be used to add button closures on a bracelet instead of c-clips. It’s easier to thread bands through a button using an old embroidery threading trick for thick threads. Take a thread that will easily go through the holes of your button doubled. 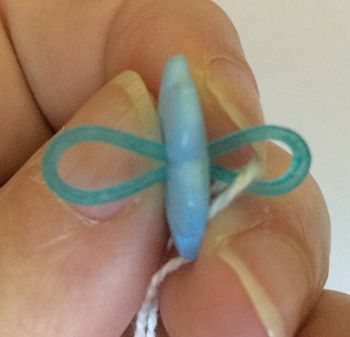 Use a thicker thread like perle 8 or 10 rather than sewing thread as that might cut your bands. Thread your band onto your piece of cotton. and pull the band halfway through. Thread the same band through the other hole in your button. 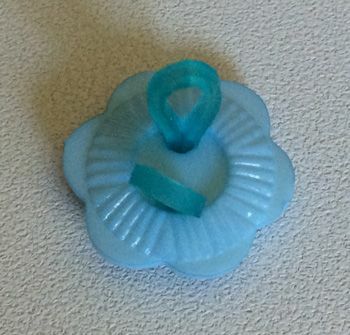 If your button has four holes, use two rubber bands, one for each pair of holes. 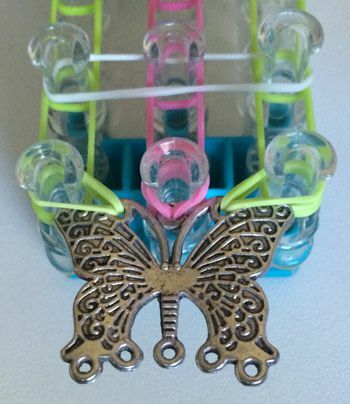 Put your bands on your loom, then the button last of all, just as I did for the butterfly bracelet. 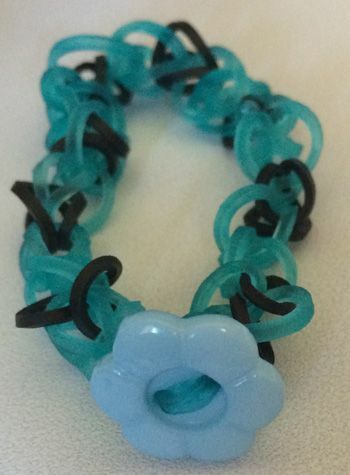 When you’ve finished hooking your bracelet, put the button through the last band that you hooked to secure it and you have a rainbow loom bracelet with a decorative button closure! 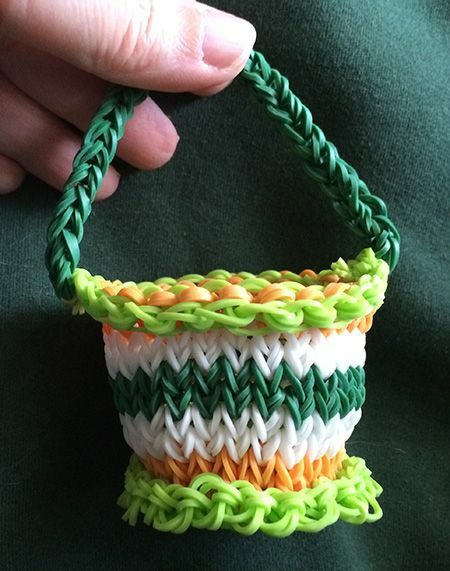 Charlie’s latest request for a rainbow loom project was for me to make him a basket. There are a lot of videos on making baskets and bags andit took me quite a lot of video watching to find what I consider to be the best one. Craft Life have once again come through with a very cute project and high quality video. 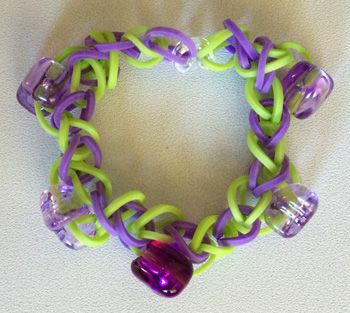 Click here for Craft Life’s rainbow loom basket tutorial. 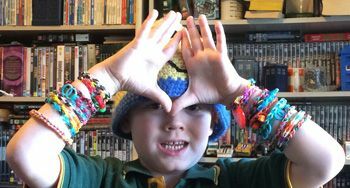 Now, I need to buy another loom and find an equally good video on making a bag because he wants something flat and larger, lol (no, I do not indulge my children that much! He’s saved up for his own loom and as soon as the local shop gets one in I’ll be borrowing it). 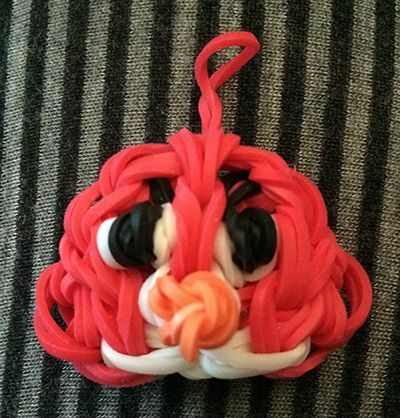 Charlie is a big Angry Birds fan, so I thought I’d have a go at he insisted I make him a Red Angry Bird charmon the rainbow loom. I think it turned out quite well, even though I didn’t have the right coloured bands for his belly. I would rate this as a challenging project. Because of the amount of bands on some of the pegs, you have to pay very close attention to picking up the correct ones when moving them with the hook. 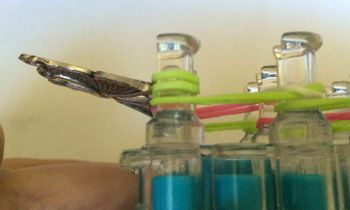 You’ll also need good quality rubber bands as they are under a lot of strain during certain parts of the construction. I used the following video by DIYMommy to make my bird. It’s very thorough but a little bit fast to keep up with. Judicious use of the pause button will solve that problem, though. Anyone who has been following my rainbow Looming adventures so far may be wondering why I skipped straight from beginner projects to advanced ones. I’ve found that my past experience with French knitting and crochet have really helped me get a grasp of the Rainbow Loom in no time flat. The ladder, or railway track bracelet is made in the same way as the triple single bracelets Charlie and I made in a previous post but, just to make sure, I checked out this video first. I made mine with ladders on every second set of posts because my beads were too large to put them on every post, which meant I also needed to make it longer to get in a full rainbow. 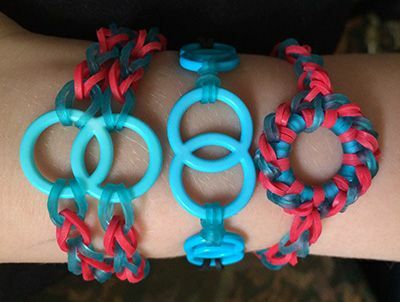 I worked out how to do it myself but this excellent video from Craft Life shows how to make a triple single bracelet longer even if you only have one loom. 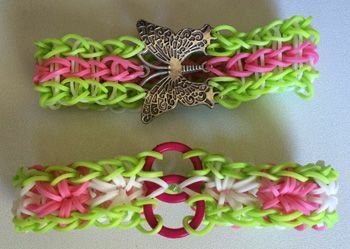 Variations of this technique work well with many different styles of bracelet. If you’re an adult, don’t be put off by the presenter’s young age, she’s an excellent teacher.